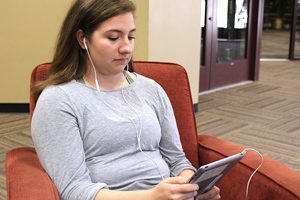 A consultation with the ACT Center is required for new students who have established an alternative format accommodation with the Disability Center. The purpose of the consultation is to determine which digital format will best meet the student's needs and to discuss assistive technology options. If you are a new student, and this is the first time you have established an alternative format accommodation with the Disability Center, this consultation is one of the final steps toward finishing the set-up of your accommodation. It is your responsibility to schedule and meet with the ACT Center for a consultation. Although registration with the Disability Center is required each semester, this consultation with the ACT Center is only required the first time. However, if the solution is not working for you, please make another appointment with us. We want to make sure all of the documents you use for your education are accessible and in the right format for you. This service is available to MU students with the Alternative Format accommodation. Please bring your personal computer with you to the appointment.